One day I was browsing through one of my favorite magazines, when suddenly I did a double take on a particular recipe. Upon reviewing the directions, I realized that I've actually made cookies that are quite similar, only they're vanilla flavored instead of chocolate and they're WAY good! 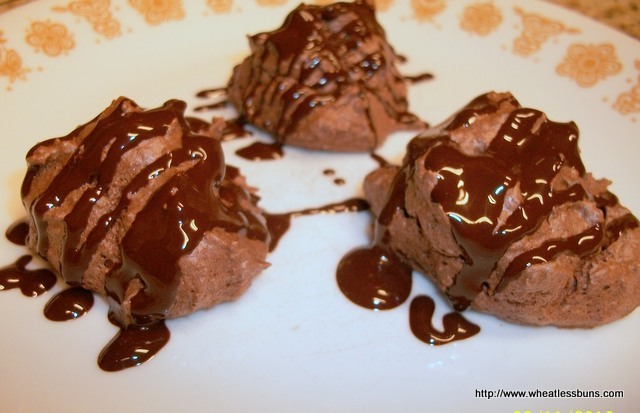 Anyhoo, this adapted recipe originates from the Prevention Guide, Lose the Wheat, Feb. 2013 issue, page 51, entitled, "Chocolate Almond Macaroons". Spoon cookies onto a greased cookie sheet or a parchment-covered cookie sheet. Bake for approx. 20 min. Allow to cool. Melt Lindt bar in a double boiler, or a heat-tolerant bowl that has been placed over a small sauce pan of simmering water. Makes approx. 1 dozen Chocolate Pecan Macaroons. Enjoy! !